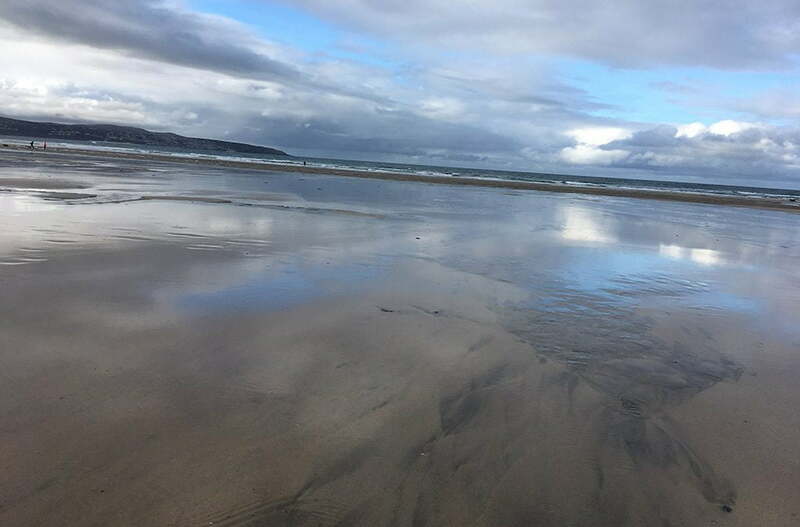 Whenever I’m feeling down in the dumps, nothing lifts my spirits more than a walk along the beach, we are very blessed in Cornwall with fabulous beaches. My favourite being Gwithian on the north coast where you can walk for miles, enjoying the crashing waves of the Atlantic ocean and gaze in a dreamlike state out to Godrevy lighthouse. I had a walk there this Sunday with my little cockapoo, Coco marvelling at how wonderful mother nature was. The watery sunlight catching on the shimmering wet sand of a spring tide was breathtaking, the skies were big and the waves were crashing. Being into the universe and cosmic ordering I glanced up to the beach houses set up in the sand dunes, gazing longingly at my favourite which sits in prime position, front line and tucked away in the last sand dune. I put in my cosmic order with the universe (a bit like going on Amazon) certain that this beach house would be delivered to me in the not to distant future. I had even longed to live in the original chalet which was purchased a few years ago and knocked down to build this stunning home. Wistfully, Coco and I turned to go home as black rain clouds were forming as we wanted to get back to the car before the heavens opened. Well – talk about Amazon Prime! I returned home to find this very house in my inbox! It was just coming to the market, and being a property search agent I’m often given the heads up on special properties before they are launched and hit Rightmove. This is how powerful the universe is. Now all I need to do is manifest the cool £1.5 million to purchase my favourite beach house! So you will see I am not your average property search agent, and that is why I won the prestigious ARP Property Finder of the Year award 2017, because I do things differently. The industry judges said that my passion for property, people and Cornwall shone through like a ray of sunshine. I often sit in my garden office gazing out to sea, ordering special homes for my especially busy people, and sometimes I am presented with the perfect house in Cornwall from the most unexpected places!